Yesterday I shared my idea of using the same ingredients for cooking an adult as well as a child friendly meal (click here for the article). 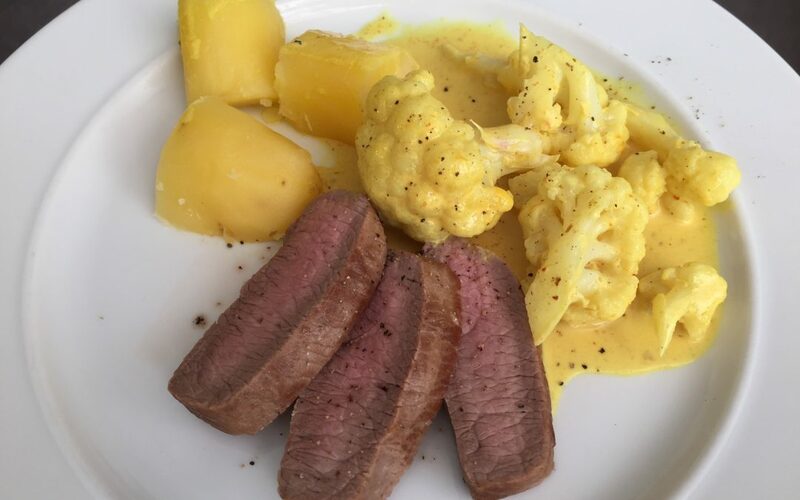 Adult version: Cauliflower in coconut milk with turmeric and red curry paste (original recipe by Pascale Naessens) with slices of lamb and some potato (picture at the top). 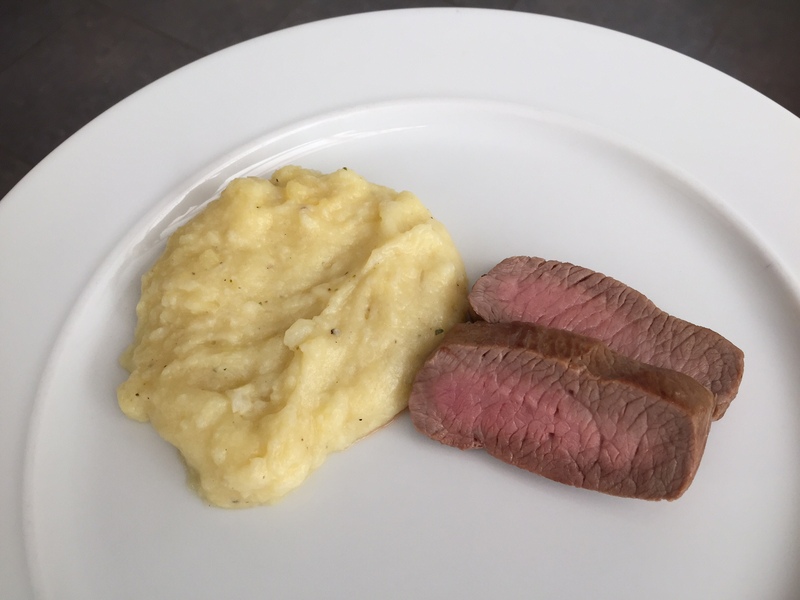 Child friendly version: Cauliflower and potato mash with slices of lamb (picture below). I spiced up the mash with some curry powder which my kids loved. Turmeric or nutmeg would also work or even keeping it plain. And here you see a picture of the wonderful left-over I just enjoyed combining the cauliflower with the mash, I added some pine nuts to add some protein. By the way, the basil leave was only to please the eye this time, I was missing some colour in the picture :-). The coconut milk is a good source of healthy fats, don’t be scared about eating fat. Our bodies need fat, the healthy types of fat. It gives us energy, is important for proper functioning of our nerves and brain as well as for maintaining healthy skin and other tissues. And of course it’s also important for the absorption of the fat soluble vitamins A, D, K and E.
Then there is turmeric which contains curcumin and curcumin is not only a powerful antioxidant, it also has anti-inflammatory, antiseptic, anti-fungal and anti-bacterial properties. I add black pepper which is not in the original recipe because black pepper increases the absorption of turmeric making it even more potent. Some doctors recommend it as an effective natural pain relief, in more concentrated supplement form. 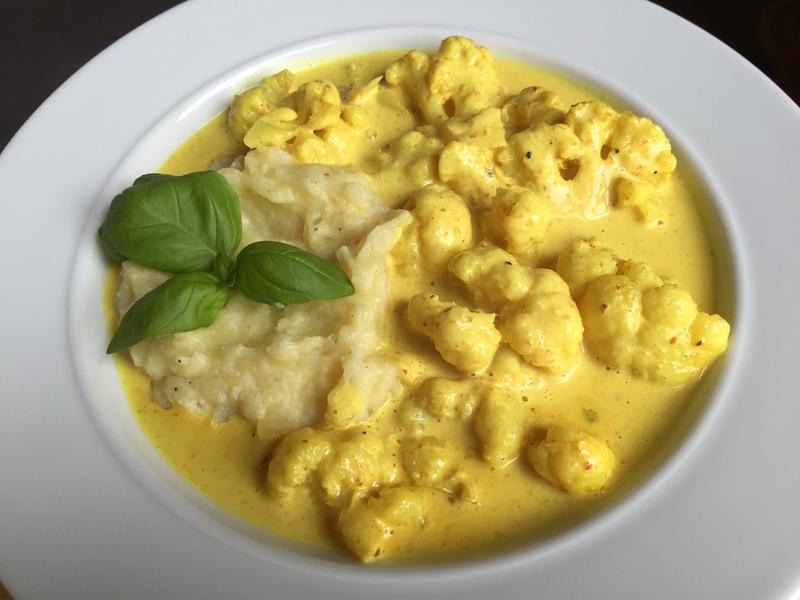 Cauliflower, a cruciferous vegetable, is loaded with vitamin C and K as well as with folate and vitamin B6. It also provides you with fiber and lots of phytonutrients which have additional health benefits to vitamins and minerals. Cruciferous vegetables in general help support a healthy liver. If you have sauce left over, freeze it. You can use it some other time to cook your quinoa in it. You can add water or more coconut milk to have enough liquid for the quinoa. If you use coconut milk only, you’ll need some more than the 2:1 ratio of liquid to quinoa. To receive more healthy, delicious and I-can-do-this-too tips, join our community by signing up here.